This is an incredibly easy dessert that takes less than ten minutes of hands on time. 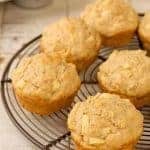 We use cornflakes for added crunch in the topping, but any unsweetened flake cereal will do. 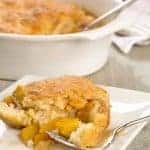 A little cinnamon in both the topping and the fruit filling enhances the natural taste of the blueberries and adds a subtle note of spice to the flavor. Wash the blueberries and gently pat them dry. Preheat the oven to 375°F and butter the bottom and sides of a 1-1/2 quart baking dish. Place the blueberries in a large bowl, sprinkle with the cornstarch and cinnamon and toss to coat. Add the lemon juice, mix well and transfer the mixture to the prepared baking dish (see recipe notes). Set aside. Place the cereal in a food storage bag and using a rolling pin, crush the flakes into coarse crumbs. You should end up with 1/3 to 1/2 cup. 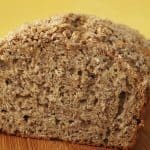 Place the cereal in a bowl and add the flour, sugar and cinnamon. Mix well. Add the melted butter, combine thoroughly, then taste and add more sugar if desired. Using your fingers, crumble about half of the cereal mixture over the blueberries and combine gently. 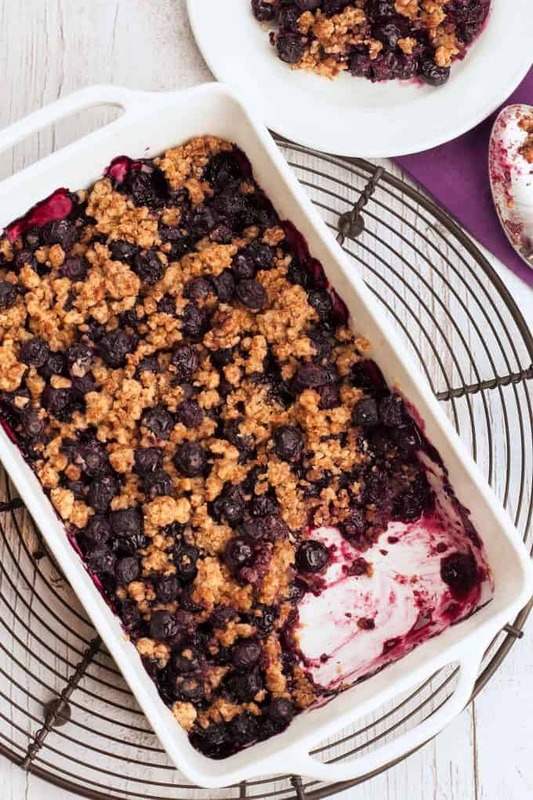 Crumble the remainder of the topping over the berries, cover and bake until the berries are tender, 30 to 35 minutes. 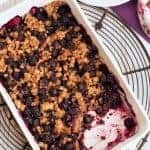 Uncover and return to the oven until the topping is crisp and golden brown and the berries are bubbly, 8 to 12 minutes more. Allow the crisp to cool for 30 to 40 minutes, then spoon into individual serving dishes. Top with fresh whipped cream or vanilla ice cream if desired. 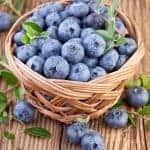 Taste your blueberries and if you find them to be especially tart, you may want to add 1 tablespoon of sugar along with the cornstarch and cinnamon. Ok I have to admit I am not a huge fan of blueberries but that dessert looks amazing. I like the idea of using a cereal topping. I’m one of those people who cooks but doesn’t bake but this looks easy enough. I think I’m gonna try it tonight. Let you know how it went if I don’t blow up the kitchen first.